Crafting for my boys birthday party is in full force. I am actually feeling a little frantic about it all and am kicking myself for waiting till the last minute. Fortunately things are coming together quickly. 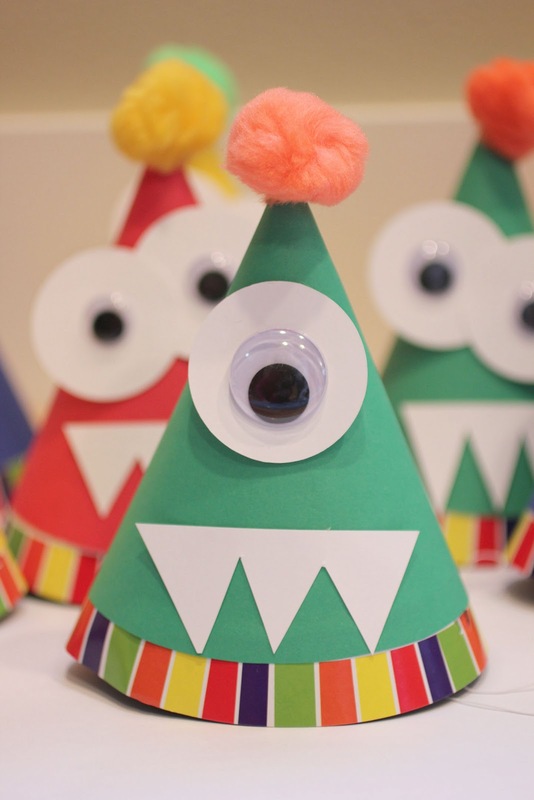 Like these monster party hats! These were very simple and CHEAP! You can get a package of 8 party hats for $1.00 at the Dollar Tree. I had the rest of the materials at home (goggle eyes, colored paper, pom poms, and a hot glue gun). THIS was my inspiration. First I deconstructed one of the hats to use as a template. I liked the bottom pattern so I cut that off of the deconstructed hat and then traced what was left on to different colored card stock. Cut out your traced template, as well as 2″ white circles for the eyes. I used my Cricut to cut the circles, but you could use a punch or print out 2″ circles from your word processing program and cut those out. Now start gluing everything together! 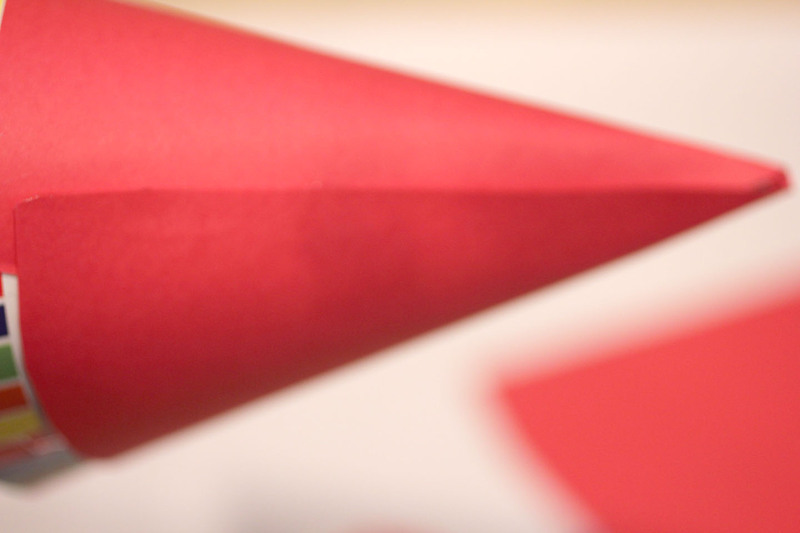 Make sure you glue the seam of your colored card stock in the back. Glue the goggle eyes onto the circles and the circles on the hat. Cut out different size spiked teeth from white scrap paper and glue those on for the mouth. 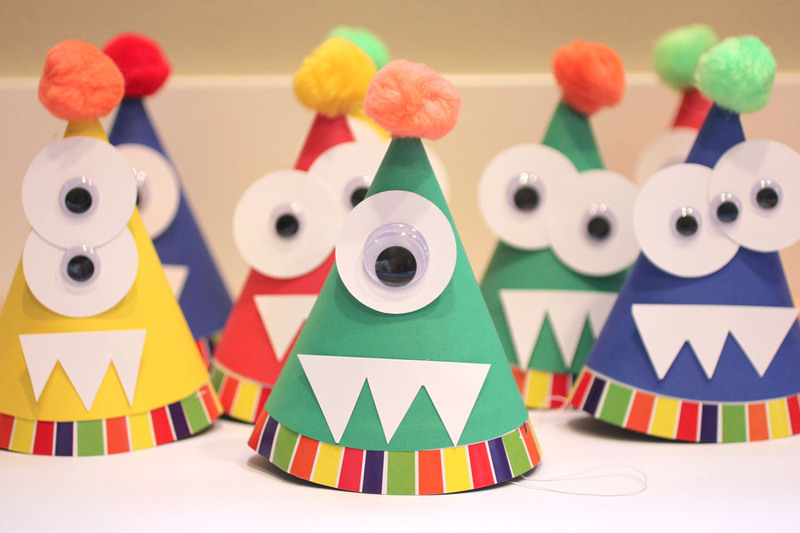 Glue a pom pom on the top and you’ve got yourself an adorable monster party hat! These hats are adorable!! I am throwing my little man a monster party for his 3rd bday next month and these are a now a MUST! I found you at the Catch a Glimpse link party, and am so glad I did 🙂 Newest follower!! Didi, thank you for pinning! Tonii, my son is turning 3 as well! 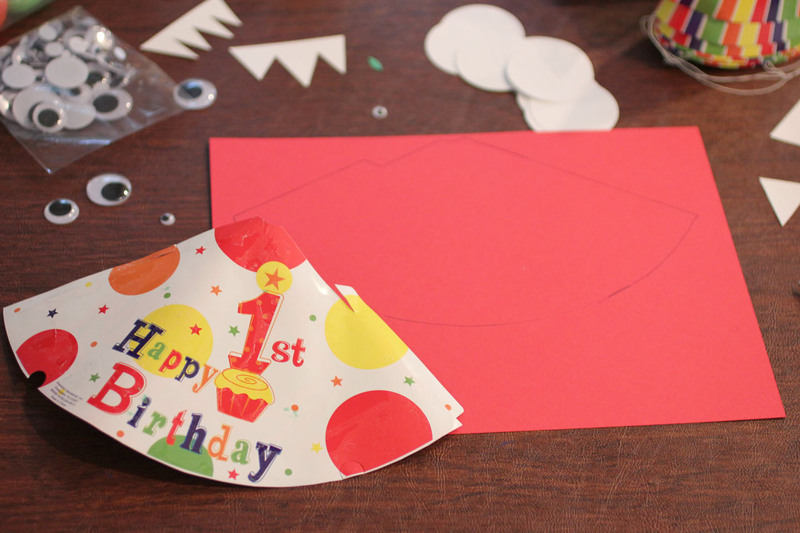 Keep checking back in the next two weeks for more monster birthday crafts and decorations!! This is sooooo cute! I would LOVE to have you share this at my link party going on right now…and if you like what you see becoming a new follower! Following you VIA GFC. SOOOO cute! i would love for you to link this post up to my weekend wrap up link party: spread the love. Cute I love these!! What a fun craft for the kids! Thanks for inspiring me. 🙂 Newest follower!! These are absolutely adorable. I love the big google eye. Thanks for pinning and giving me the opportunity to share at your linky party!! These are so fun! Just LOOOOOOVE those googly eyes! Found you on Artistic31Mama – would love for you to stop by for a visit. This is so cute! You should come link up this week to the CSI Project. The challenge is Embossing and paper crafts. Any paper crafting. You can link up to 3 projects. The link up begins Wednesday night. Come on over everyday for tutorials. Every week is a new challenge. These are so fun! Cute, cute, cute!!! Adorable hats! Love all the eyeballs. Nice photo too! What a cute blog you have. These are so cute!! Thank you for sharing at Sharing Saturday! I hope you will share with us again this week!! Oh my gosh these are adorable!!! Found you through the CSI project! Thanks for linking up last week! You were one of the featured posts! I linked up with your post on Facebook and Pinterest. I would love to see you join us this week again! 🙂 This weeks linky party is now active.